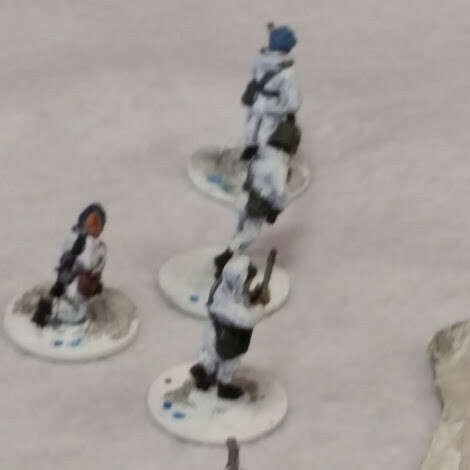 Cold Wars 2016: I’m out of order? 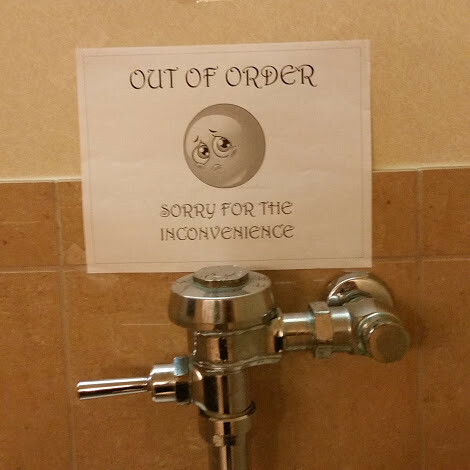 You’re out of order! Start with flat black on all the shiny and metal parts. 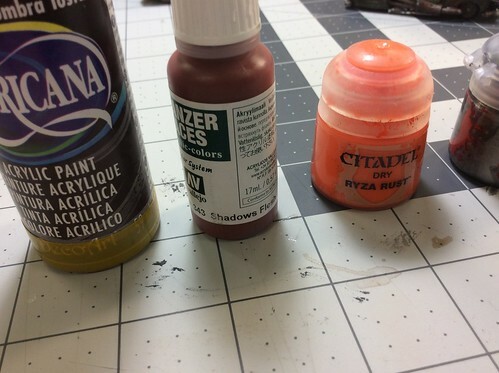 Then go with a Burnt Umber dry brush, then with a Shadow’s Flesh dry brush, then actual orangey rust color. Then highlight with a darker silver. the result is multilayered and subtle, far more subtle than the cars I’ve been doing. 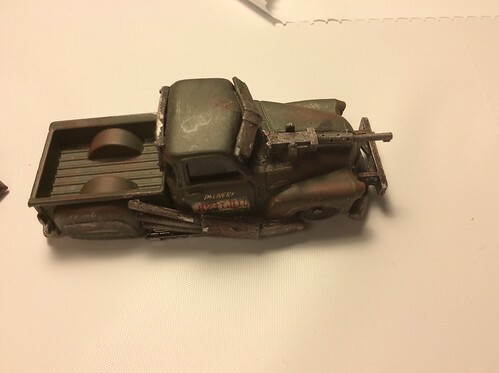 Gar made an up-armored “Stretch Nash rambler” with two Gatling guns on a rack up top. I really enjoyed Joey’s class (which also taught me the benefits of Zip Kicker) and would recommend it to anyone. 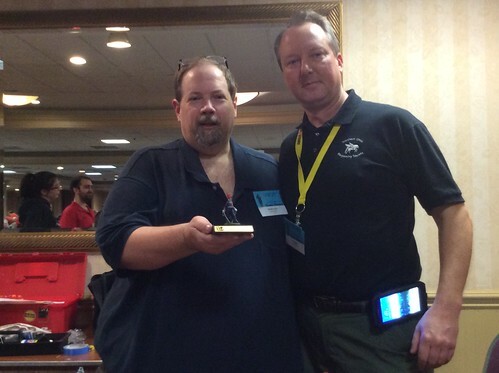 Special thanks to Lon Weiss from Brigade Games for providing packs of add on weapons and armor for this class. 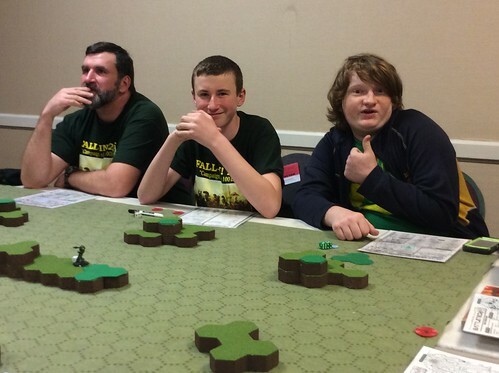 Gar has become a big fan of Battletech (the FASA product, now owned and supported by Catalyst Gaming Labs). 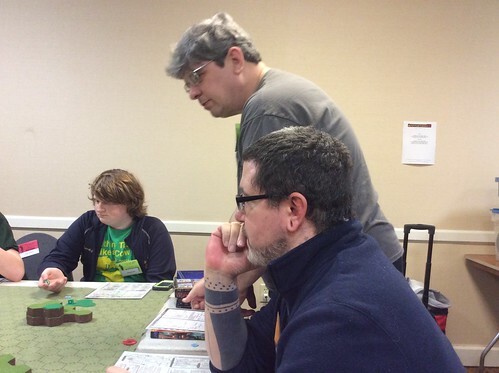 So he looked at the schedule and decided to go sit in on the Battletech Grinder games in the Cornwall Room all weekend. The Grinder, apparently, is a Battletech competition where you play, get killed, and come back as a different, hopefully stronger, mech. 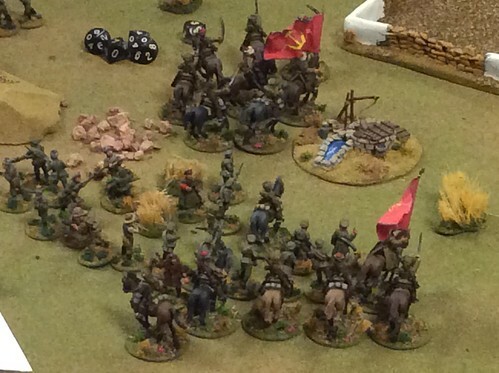 Garrett ended up with a Battlemaster at the end but only had it for a couple of turns before they ended the Grinder. So it goes. 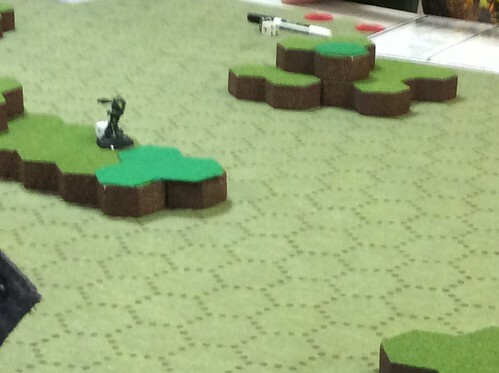 Thanks to the guy running this event (which was more than one table, it was a room of Battletech, btw), and thanks to MOST of Gar’s opponents for being nice to the newbie. The less said about the loud-mouthed kid who complained bitterly about every roll of the die that went against him, the better. 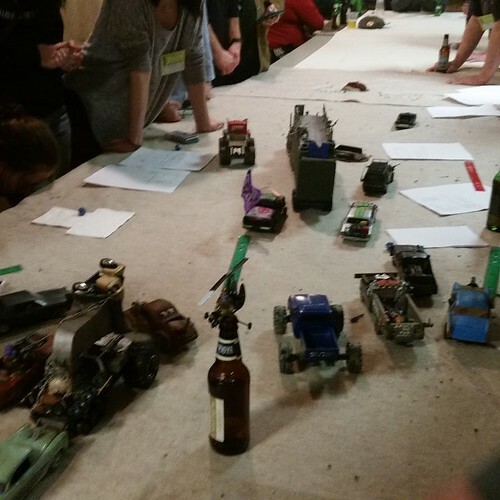 I got into a pre-Dreadnought game Friday night. 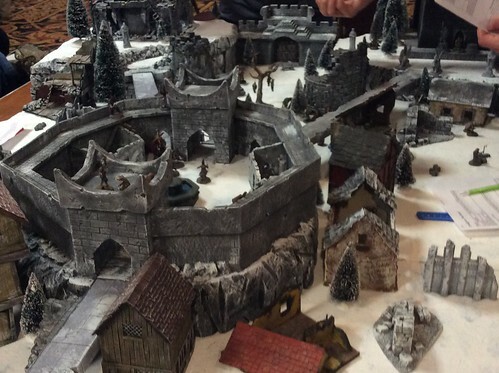 I wanted to try out FROSTGRAVE but couldn’t get in to the Friday night game, it being full up. So I went with a back up plan, and I’m glad I did. 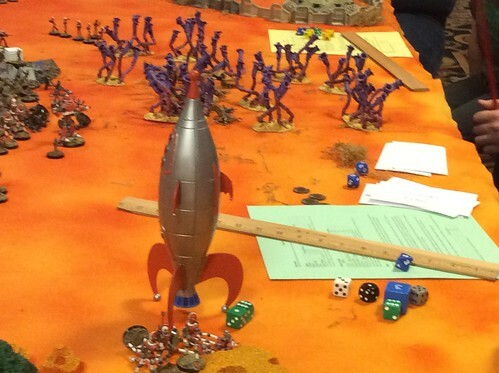 I got a ticket to the Deadly Warfare games playtest of “Black Smoke and Blue Seas” or something like that. More on this later, since I spent some time relieving myself of money in exchange for hobby items Friday until “go time”. 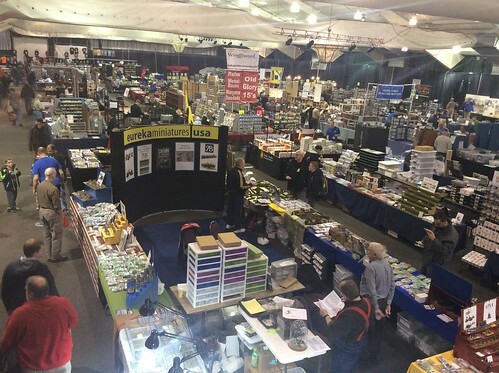 The dealer’s room was the dealer’s room.. we can’t expect the giant vendors of bygone days and should be grateful for the ones who show up in force, or the old standbys that are still making a showing, albeit in a greatly reduced footprint. I got a copy of the Pre-Dreadnought rules (Black Smoke, Blue Water) we were about to play for the playtest, and starter fleet for Manila Bay. I also picked up a cigar box battle mat for a medieval/fantasy city, probably for running Frostgrave on. 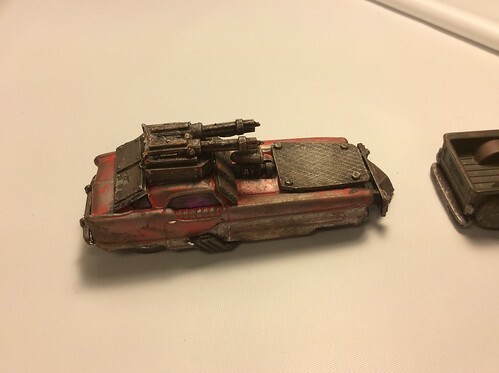 I got some nice pieces for Road Warrior/White Line Fever in a leftover parts bin at Hobby House, the new Cultists expansion for Frostgrave and the spell cards, because, well, they’re nifty looking and pretty handy.. besides, I wanted to thank Brigade Games for sponsoring Hobby University by throwing some coin his way. I was going to get troop cards for BLUCHER, but, sadly, they were sold out when I went back for them. I looked over the flea market as well, but didn’t find much of what I came there to buy. I was looking for AQMF Martian stuff (which hasn’t taken a nose dive in price like I thought it might), as well as 15mm SF and some other bits and bobs. Sigh. Events: Given that I was only there from Friday morning-ish until late Saturday night, I didn’t see everything. However, I did like most of what I saw. The ballroom wasn’t jammed on Friday, which usually has people complaining about the empty tables, but every game I saw didn’t lack for players (YMMV). 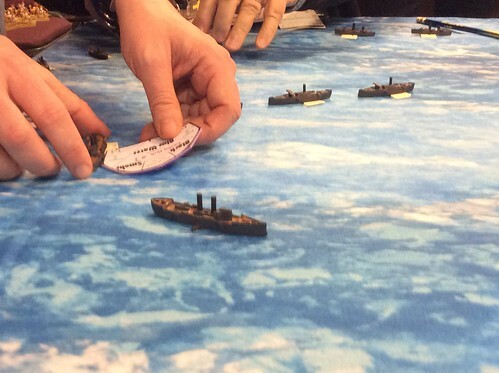 Friday night around 6PM I participated in the playtest game of BLACK SMOKE, BLUE WATER. This is a game of Pre-Dreadnought era ship combat, with some important caveats; this game setting assumes about a twenty year leap forward in technology, so it adds some elements that would be missing in a straight up historical period game, such as air operations, submarines and etc. The game played well. I thought the combat in a multiplayer game really slowed down somewhat when the ranged narrowed and many options (based on calibers of weapon) opened up. The designers welcomed feedback and got some good gouge from the players. 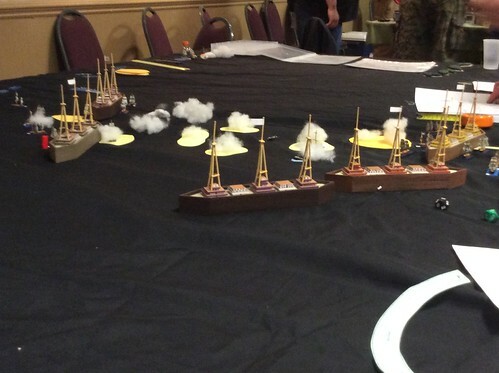 The game scenario was Manila Bay (the same fleets I had bought that morning). The American fleet is entering the board just clearing Cavite island which has a battery that can shoot out 36 inches. Not having any operational need to land on Cavited, we just cheerfully ignored it and steamed onward, keeping more than 36″ out of range. I ran the Olympia and the Baltimore. For much of the fight we were the chief American ships engaging the Spaniards, but it was still a one sided contest (not in the Spaniard’s favor). 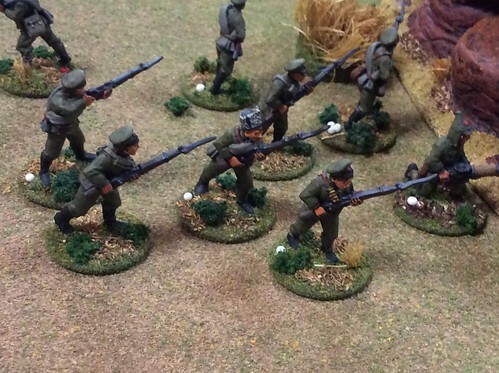 I felt bad for the Spaniards.. their Torpedo Boat force were pretty close to Cavite at the onset, but when it was clear we weren’t going near the place, they had to spend most of the game running in flank to engage the Americans, only really coming close in the last few turns. The Spanish Admiral was quite aggressive, unlike his historical counterpart, and gave almost as good as he got. In game terms, the Olympia was the best ship on the board (and that bears up with the historical battle). Having guns of over 7″ was a big advantage in certain situations and that contributed to the American fleet sinking a Spanish battle cruiser. We called the game after a certain point and discussed the mechanics. For a small slide show of the engagement, please click on the picture below. It was a fun game experience, and I do like the rules. I find the combat to be a little drawn out, but what can I say, they are correct in modeling all that gunfire, such as it is.. each of the ships of the era had a veritable battery of Primary, Secondary and Tertiary gun types of various sizes and calibers. They were effective in their roles, up to a point. My torpedo (the only one that hit of the six that were shot) was what ended the one Spanish ship that sank, and that also seems to reflect history.. the ship guns weren’t huge and they weren’t very accurate. It just seemed to be a remarkably bloodless engagement compared to the actual historical Manila Bay. 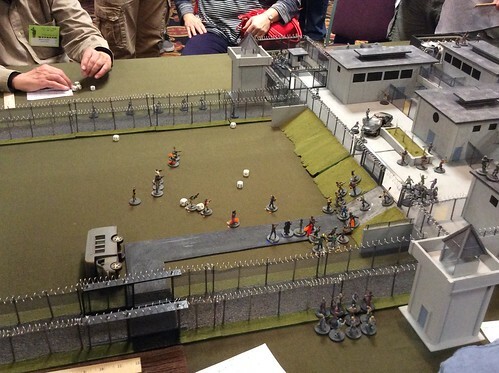 Jon Paul Cosgrove’s excellent “Zombies attacking a Prison that is suspiciously like the one he worked at” game had some amazing scenery. There was a Russian Revolution/Civil War game going in the back, not sure who ran it but it looked like tons of fun.. and was a beauty to behold. 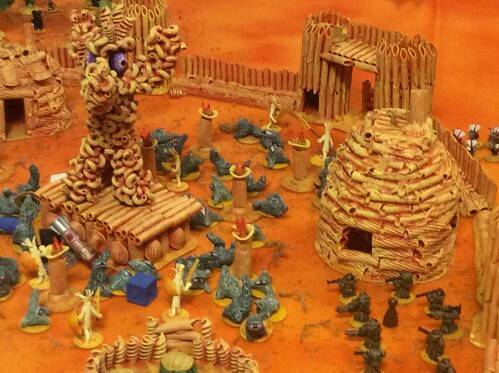 Invasion of the Pasta People? Maybe? Whatever! Looks like it was a blast to play.. and it certainly was colorful. 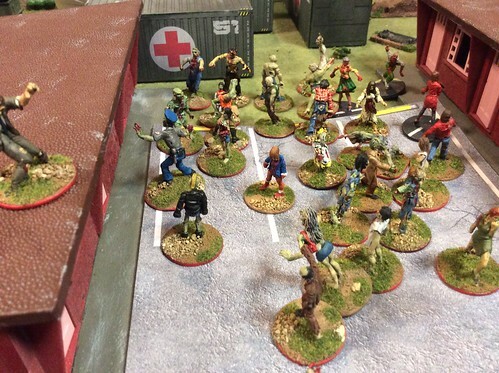 Jim McWee was running a zombies overrunning a town game that I think he has run before. Sure was nice and colorful! One game I wanted to capture in pictures was a double blind game of MIDWAY based upon the classic Avalon Hill game of the same name being played in the Distelfink. It was fantastic. Fortunately the guy who writes DE NERDIBUS got a few pictures of it and I include the link below. Saturday morning Gar and I got in to the one game we both played together, which was S161: Frostgrave – Cold Harbor, run by Jon Lundberg. I had a really fun time playing this. I had a Chronomancer and small gang (including a polar bear!). We slipped in to the city from the South side, hardly killed anyone (except for a rampaging killer snowman) and was altogether too polite — not a lot of blood was spilled. Still, I got 4 treasures off the board, which is a respectable showing, I think. Click the picture above to see a very small album of pictures from the first Frostgrave game I played Saturday Morning, if you have an interest. 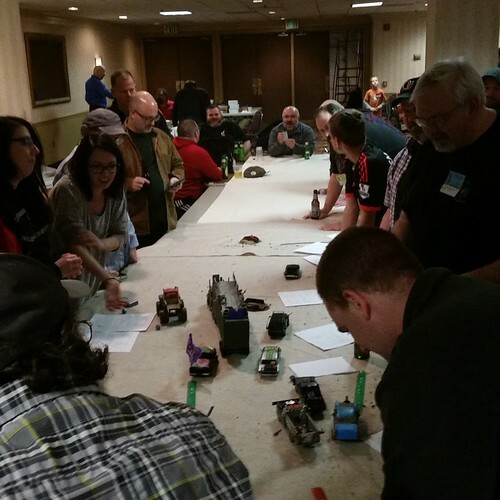 “I attended the membership meeting at Cold Wars on Friday night at 7 pm. Three hotel chains are in negotiations to buy the host, two are national changes one is a regional chain. THE HOST sales rep says that all of them will NOT tear the host down but will repair and restore it bit by bit, one section at a time. The guest rooms will need the majority of the work, but the meeting rooms will need not much more than some new carpets and cosmetic changes. The heating and air conditioning plant will be replace and some electrical work done and the bathrooms repaired. This was reported by the Bod who said that the impact on us would be, if we stayed, that the hotel would lose 60 rooms at a time as they were reconditioned, but that could be taken up by surrounding hotels. They did say that the room rate then would, according to the host, go up to $149 USD a night. The BOD also said they were looking at other venues including YORK convention center and Lancaster Convention Center, both of whom had been rejected previously and Dave Waxtel is investigating a location in Somerset County NJ. No name was mentioned. I had a report from the owner of the Continental hotel who is heavily involved with the local hotel organization that the host is in receivership (or soon will be) to the bank. This was not said at the meeting. The Bod announced that Fall in 2016 will be at the host and Cold Wars 2017 will be there also. After that it would be as negotiations with the host and new owners progressed. 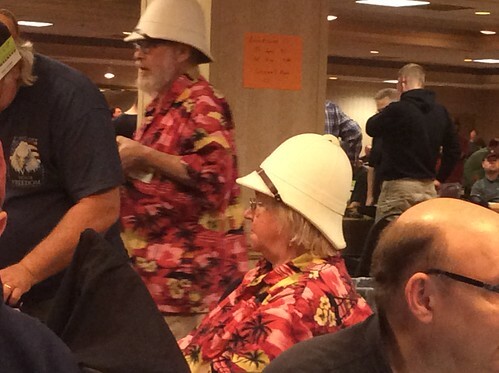 The BOD said they were looking at a cost saving measure of buying tables for the convention. They said their largest expense each year was $60,000 USD for table and chair rental. They were investigating buying these (folding chairs) and it would cost about $25,000 USD total. The original plan, (pre-auction) was to store these at The Lancaster Host and let the Host Use them for other events and the host would pay us a fee when this was done and that the cost of the purchase would then be amortized over about four years. This plan was put in abeyance after the auction kerfuffle, because it was realized that if we did that the tables and chairs would be seized if a foreclosure was processed, and it did not mater if we owned them. If a bank or agency does this, the release of them would not take place till all creditors with outstanding charges against the hotel were satisfied, and any assets or possessions on site would be part of “inventory” and so sold off. No discussion was made of the chairs and table rentals for Historicon in Fredericksburg and the rental cost was not broken out for that, nor was it said if the tables and chairs allegedly stored at the host (if it came to pass) would be trucked down to Virginia) nor the cost of haulage and dunnage for that. There was some other reports about someone attending Salut in the UK (Dave Waxtel) and as to whether he was paying for it or the Board. Dave is. 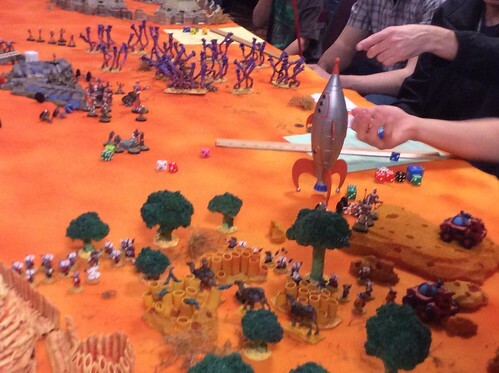 There was a lot of discussion (on TMP or elsewhere) as to whether a Salut “diorama game” convention will work in a US market (most Americans think not). There was some discussion about paying clubs or GMs to run large set piece games by helping them with their construction expenses. “This is paying GMs to run games” was mentioned from the floor. There was some contention– I could point out HMGS has paid GMs in the past and has the leeway to do it on a per show basis.. just ask anyone who has paid for “Uncle Duke” in the past. As for the comments about the Host. Hmmm. I fully expected 2016 to be the last year I would be going to a Cold Wars game at the Host. I’m astounded that chains are interested in this property, but apparently it is fulfilling a requirement for mid-income to low-income convention gatherings that no other property around can fill, and there’s a real economic need for a property called the Host. Still.. there’s SO MUCH work to do to fix this place up.. 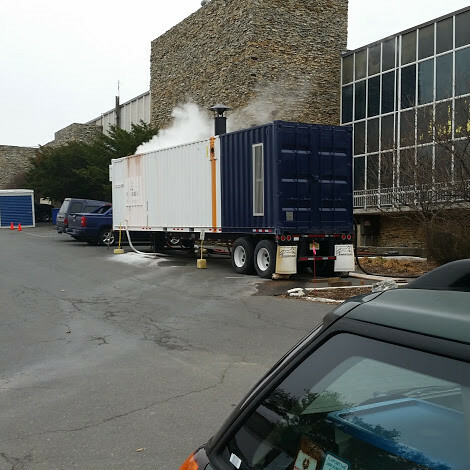 The temporary physical plant, now taking up several parking places.. this keeps the place in hot water.. most of the time. Downstairs toilets were broken most of Saturday– with big yellow “do not cross” police tape covering the doors. One of the urinals UPstairs broke, too (pictured). So at one point, there were only three urinals and 5 stalls for the entire Lancaster host facility (working). Everywhere, everywhere.. there’s signs of decay and crumbling. The kitschy cool sixties rock exterior is crumbling off the building in several places. The railing up the side of the handicapped ramp to the lobby is now floating in mid air in all but two places.. The roof.. well, you know about the roof. Saturday night I resolved to get into another game of Frostgrave, as I like the rules a lot. 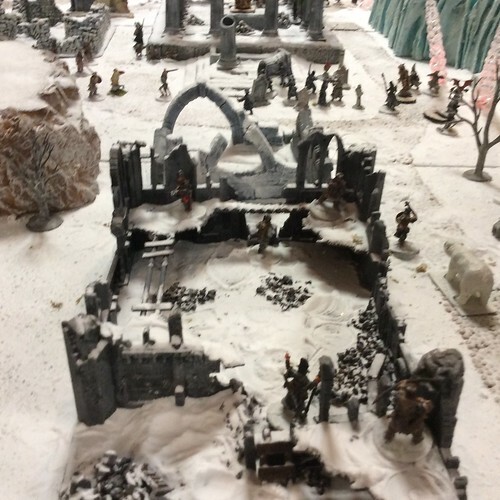 I really wanted to attend S244: Frostgrave: Treasure Hunting in the Frozen City. I was the last alternate to get in. 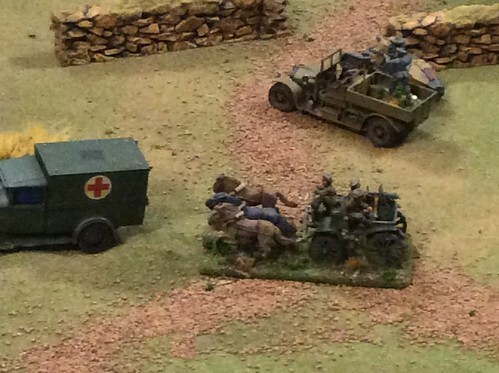 Jeff Hiley’s terrain was simply fantastic. He won an award for it in the middle of the game! I played a Summoner for this game, and managed to nab 4 treasures.. but only got two off board by end game. We were doing the good versus evil thing, which suited me. 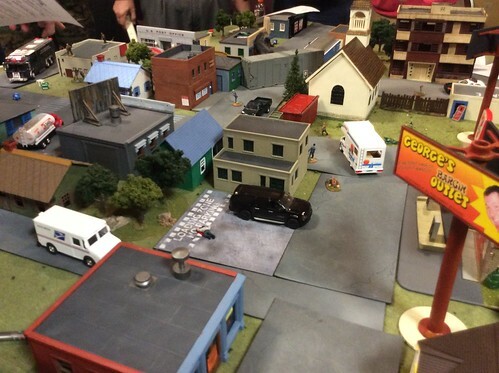 This was my favorite game of the convention by a country mile; this is not to say I didn’t love the other games too, I just got into the setting so much with Jeff Hiley’s terrain efforts it was hard to come to any other conclusion. 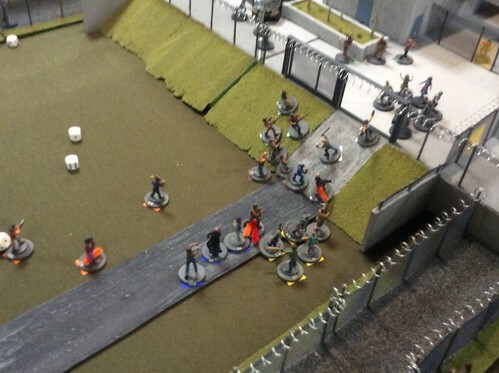 We got into a big fight with some do-gooders at the choke points on the ramp. I think I was up against a Thaumaturgist at least. Sadly the only spell I had much of a shot with was LEAP, which did work most of the time, and Summon Demon, which was ineffectual most of the game. The rest of my spells were just too blinkin’ hard. 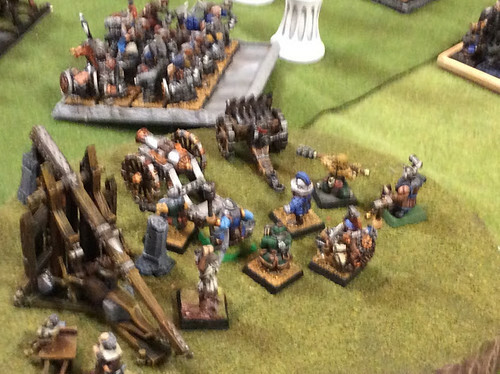 There’s a nice slide show of the Second Frostgrave game Saturday night below, if you have an interest. Just click on the picture. As it was 11PM at this point, Gar and I had to bail out and head home.. it was an easy trip but we were already pretty tired so didn’t want to press our luck. Sadly we had to miss Eric’s Road Warrior game, but it’s just as well, I prefer the HO sized one. So that was our COLD WARS 2016. For me, it was the Frostgrave Cold Wars. I’m quite taken with that game and am painting up some warbands. The decrepit surroundings didn’t make the convention run less efficiently (though there were and are the usually carping about things that never seem to change, like long lines). I definitely gamed more and enjoyed myself more than I usually do at conventions. 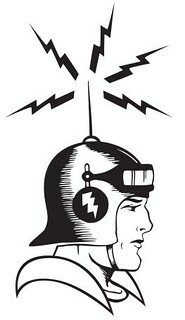 Thanks to all the crew who helped me get Guidebook done for this convention– Theresa, Paul, Scott, Scott, Heather etc. (see previous post on that subject. I did try a few new things this year, like taking pictures and uploading them to the guidebook. Not sure who can see these or if they are shared to the general guidebook user base or not. In any event, Guidebook was its usual useful self. The CD of Cold Wars really could care less about it, but the attendees do, so I’ll keep doing it despite official indifference. Finally, if I could sum it up, I’d say this was a convention of interesting games and some good times. My son came with me and I encouraged him to go off and find his own groove.. he hung out with guys his own age (or older) all weekend and had a terrific time. I played in some great games, and saw some great games being played. 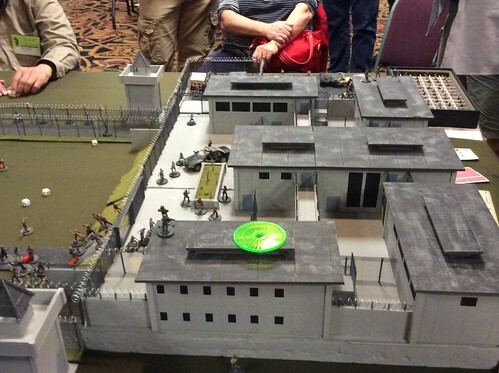 It was more of a game playing convention than a shopping con for me. So as the sun set swiftly in the West, we drove home, tired and all conventioned-out. See everyone at HISTORICON!!! Nice summary, Walt. I saw you there, but missed the opportunity to say “hello” this time around. Oh, wait, did I briefly stop you ask you about this blog, and how long you’d been doing it, or was that all a dream? Yes, we traded some airy persiflage about the cringeworthy early artifacts of the interwebs that are still out there after almost 25 years.